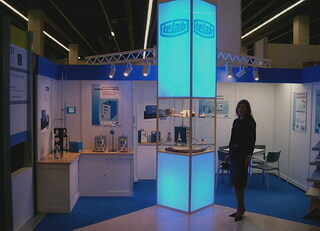 Starting with TELAB we are the German specialist for development and production of highly precised dosing systems. We focused on a maximum of chemical restistance as well as a universal application for pumping and volumetric dosing of liquids and gases. We achieved our leading position with a consequent usage of PTFE-materials and the implementation of positively controlled device valves in the diaphragm dosing technology. Our dosing and metering systems work like maintenance-free and are not subject to wear. Their robust construction is reflected in extremely long operating times. Even with constipation or closed valves take the doser no harm. Safety and cost are your advantage. Today allows us own development in the areas of software and hardware development to meet the increasingly complex requirements of our customers a timely and cost. In the wake of these developments a number of new products and product lines now complement our business with precision dispensing. We develop our products further to secure our leading position in the precision and micro-metering of liquids and gases in the future. For special applications are modified PTFE materials with FDA approval available for TELAB. We integrate our feeders in complex mini plants equipment or automation systems and adapt our equipment to your requirements. For special applications there are numerous special versions available.